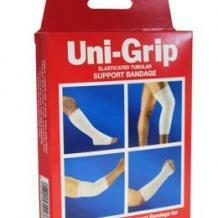 Unigrip provides lasting, effective support with complete freedom of movement. Covered elastic threads within the fabric move to adjust to the contours of the body and distribute pressure evenly over the surface. Fitting is quick and easy. If applied as a double layer to the appropriate limb size, Tubigrip will exert 10-15mm Hg to the limb. Reusable/washable. Clinically proven.